I own this one and yes it is definitively the best released available. But I really don't like the design of the cover, because of the head velcro and the fact that you can't place it in the same side as the other dvd in your movies rack. The first thing I noticed about this movie is that when watching the first half an hour of the movie you can forget that you are even watching a horror movie. That first half an hour feels more like a movie about college buddies backpacking it through Europe. But then when they get to this one particular Hostel... that is where all the fun begins. Then the horror hits pretty good. This is not much of a movie for scares... it is more of a shock value type horror... with a generous amount of gore. Though I will admit that I remembered it to be a bit gorier from the first time I watched it. Over-all... while it is not the best horror movie I have seen lately. I did enjoy it quite a bit... and can see myself watching it again. Six ordinary strangers awaken to find themselves in a seemingly endless maze of interlocking cubical chambers armed with lethal booby traps. Without food or water, they have only a few days to live. None of them knows how or why they've been imprisoned, but soon discover that each possesses a skill that could contribute to their escape. As they work together to extricate themselves from their claustrophobic cell, one thing becomes painfully clear—unless they learn to cooperate to solve the secrets of this deadly trap, none of them has very long to live. I first popped in this movie for my Gore-Fest Marathon because I remembered the opening scene... which is rather gory and fits the bill. Unfortunately there was only a couple such scenes in this movie. For the most part this movie is not really that gory. At least not to the point of inclusion of such a marathon. If I would have remembered that I would have picked another movie. But with that said... this is a favorite of mine. As I said it does have some gore to it... but it has much more then that... this movie shows what people are capable of in the name of survival. And you better believe... some of it is not pretty. Another thing I really enjoyed in this movie... it was my first introduction to Nicole DeBoer... an actress I quickly became a fan of. I read that there is a commentary with Romero and Savini... and read this is THE version to have... at least in R1 land. I also understand that the Divmax release is the best available (except for the Bklu-ray, of course ) and the one I own myself (the Blu-ray was a double-dip). But, don't buy it for the commentary as Romero cannot talk about his films unless moderated (and no, the feloow filmmakers are not moderators). Not that he is boring, he just doesn't know what to say about these 20 year old films. The other extras are mostly quite good. 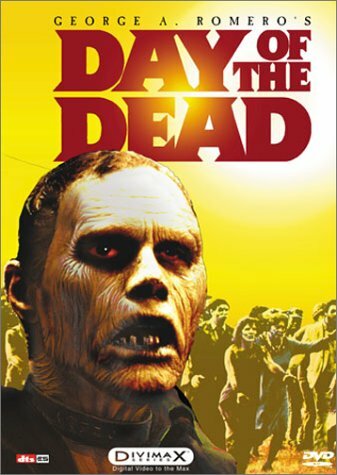 The worst Romero commentary I have listened to must have been the one I had on the Japanese laserdisc of Dawn of the Dead, where he talks with his wife (she's in it, in the opening scene, setting next to George). They were silent half the time, not knowing what they could possibly say about the masterpiece. Thanks Achim... I would still want it for the other extras then... and possibly the improved quality. I probably wouldn't notice much quality difference on the TV I have now... but I am hoping to finally get an hdtv within the next few months to a year.